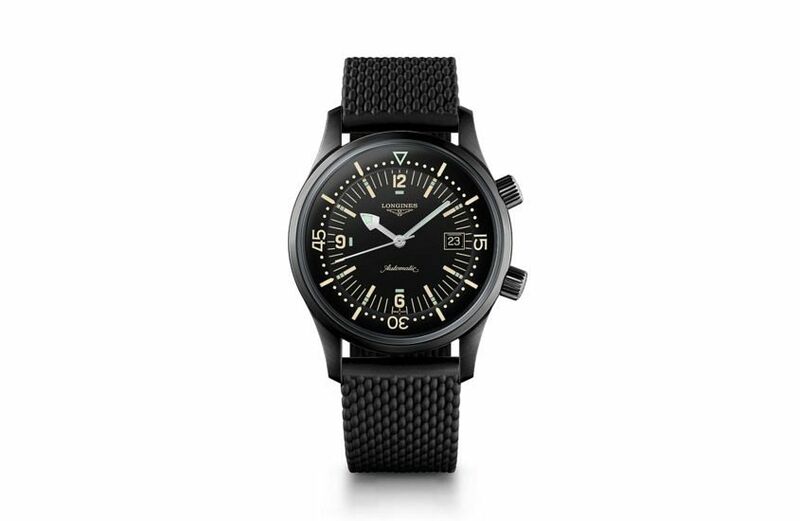 The Longines Legend Diver Watch, a reimagined version of a diving watch from the 1960s, had a dramatic reintroduction in 2017, care of the Milanese bracelet addition — perhaps the best strap hack of the year, period — and now it’s going to set pulses racing even faster with a new version in black PVD. Apart from the PVD, the Legend Diver remains true to the bold styling that made the original timepiece something of an icon in the Longines canon. It houses Longines’ L888 caliber. In terms of design, the lines of the original watch have been preserved, including the boxed glass (but in sapphire crystal) and the bidirectional internal turning diving bezel. While upholding the 1960s spirit of this legendary timepiece, Longines have also equipped it with contemporary and high-performance technical characteristics, including a black PVD coating for a resolutely modern design, a sapphire crystal, two crowns and a screw-down back to guarantee water-resistance to 30 bar. The bezel is activated and stopped by the crown located at 2 o’clock, allowing the wearer to determine the remaining dive time. The steel 42mm case is coated with a layer of black PVD and has an illustration of a diver engraved on the screw-down back. The strap is Milanese-style in black rubber strap and comes equipped with a folding titanium clasp treated with black PVD and an integrated diving extension. Pretty exciting stuff, really. Longines don’t need to prove their heritage credentials in 2018; if there’s any ground to be made up, it’s in incorporating modern touches to their reissues that can serve to ignite the design all over again. And by that we are pointedly excluding making the case bigger and/or sticking a date window on the dial. Think the Omega Seamaster 300 with ceramic bezel, or the Oris Carl Brashear Divers Sixty-Five in bronze. 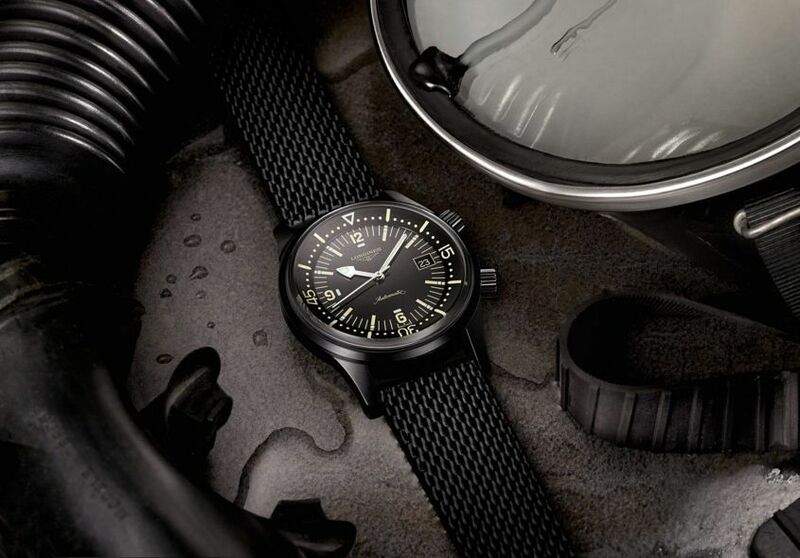 You can now add this blacked-out Legend Diver to that esteemed list. It’s going to be a smash, no doubt at all.